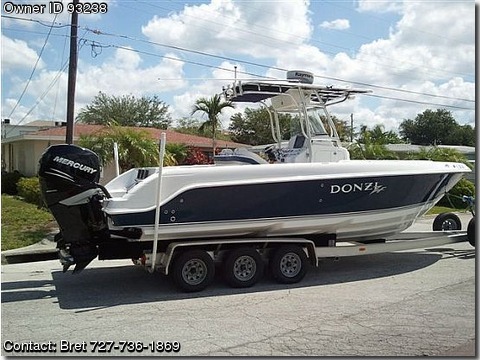 2008 DONZI 26 ZF Sportfish: PRICE JUST REDUCED! $88,900 OR BEST OFFER! Call Bret @ 727-736-1869 or 727-647-9080. BOAT OWNER'S NOTES: Donzi’s 26 ZF was designed to bring big-boat handling and features within reach, in an easy to trailer, easy to love 26-foot package, Donzi’s proven ventilated step running surface and twin-engine muscle combine for a smooth, fast, dry ride and like all Donzi’s ZF models, the 26 ZF is loaded with thoughtful features throughout, The 26 ZF features a wide-open cockpit designed especially for the offshore angler, A flat floor runs the entire length of the cockpit for wide-open, 360-degree fishing, All hardware is flush mounted so there will be no snags when it comes time to land your trophy fish, The 26 ZF’s wide beam means extra stability and plenty of room to move about, With its nimble sports car handling and surprising speed, the 26 ZF invites you to explore new horizons while pampering you with its smooth, dry ride, This boat has accommodated 5 men with 2 tanks each, all dive gear, 5 spear guns, rods, tackle and coolers for many fun days with no gear on deck or in the way. Raymarine E120 series radar, fish finder, GPS with Platinum Chip integrated with VHF. 30 gal live well w/ light. Freshwater sink and wash down with a 15 gal fresh water tank. 2 built in tackle boxes. 1 - 5 drawer large lockable tackle box. 1 - 3 drawer small tackle box. 2 Fish boxes with separate macerator pump. Lots of rod storage, 4 up top, 4 on back of seat, 8 on walls, 4 on each side. Three step removable ladder is fin friendly for diving. Radio with enclosed amp and MP3 player and additional connection. Front and Back Spreader Lights. Fold down driver and passenger seats. 1 front and 1 rear fold down seat. Lifting rings for davit storage. Plenty of storage with 5 floor lockers, 2 fish boxes and 1 equipment box in the floor plus 1 anchor box and cabin. Can store 4 coolers out of the way. Serious buyers only Trailer not included.